Breakfast vegetables aren’t as common as breakfast fruits. Most people love fruit with their breakfasts, from blueberry pancakes to banana nut muffins. So many healthy recipes call for fruit that finding your family’s favorite fruit-filled breakfast is simple. However, this isn’t always as easy with vegetables. Most families don’t incorporate vegetables into their breakfast repertoire. This is unfortunate, as many families don’t get the recommended servings of vegetables. If you are on a mission to incorporate healthy eating into your lifestyle, use these tips to incorporate fresh vegetables into classic breakfast dishes. Think about your favorite egg recipes. From vegetable omelets teaming with chopped peppers and diced onions to your favorite eggs Benedict served with asparagus, eggs are a great way to incorporate fresh vegetables into your breakfast. 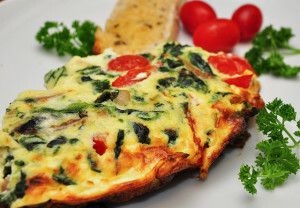 At the end of each week, you could dice up any leftover vegetables you have to make an omelet. This could change the taste of breakfast from week to week, depending on what you have on hand. If you don’t eat eggs, you could always use an egg substitute. The fresh vegetables work well with either. Many American breakfast favorites have shredded or diced white potatoes. While technically white potatoes are vegetables, they don’t offer the same amount of nutrition as other vegetables. Instead, switch diced potatoes with diced sweet potatoes or butternut squash. These alternatives are sweet and offer a tremendous amount of flavor for your breakfast. If shredded potatoes are your thing, try shredded carrots or other vegetables. These often provide fun, colorful options. There are many cakes made from vegetables. The most popular is carrot cake. Use this as your inspiration, as you develop recipes for breakfast that incorporate vegetables. You can make a vegetable breakfast bread made from shredded carrots or pumpkins. These vegetables lend themselves well to this application. For the purpose of this blog post, tomatoes are going to be vegetables. This is because no matter where you are on the debate, tomatoes have less sugar and calories than many other fruits and side dishes. While you can serve sliced tomatoes as a low-calorie side dish for breakfast, you can also make a breakfast salsa with corn and cilantro. Serve this with scrambled eggs or a breakfast tortilla with beans. Lose your preconceived notions of how you’re supposed to eat vegetables. You can eat delicious fresh vegetables just because you want to, any time of the day. Even for breakfast. Eat chopped beets for breakfast. Technically, there aren’t really any rules. If you’re looking for more ways to incorporate healthier habits into your lifestyle, contact us today for a consultation.